Are you looking for life-like newborn limbs that are 3/4 length? 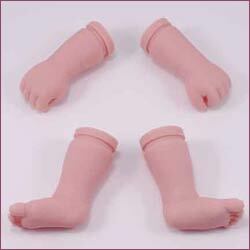 These limbs will fit most 12 - 13 inch length newborn dolls. This set includes two arms and two legs but no cloth body slip. Color of vinyl may vary depending on your computer monitor. Dimples 3/4 limbs are for a micropreemie or regular 12" doll. For use with 3/4 limb cotton body slip, sold separately. Includes arms and legs. Does not come painted. Fits our cloth body slip for 1/4 length limbs. Color of vinyl may vary depending on your computer monitor. Does not come painted. 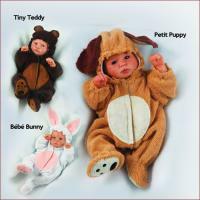 Are you looking for life-like newborn limbs that are 3/4 length? 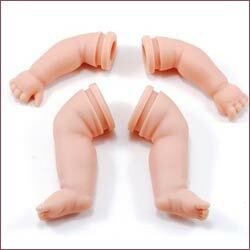 These limbs will fit most 16 - 18 inch length newborn dolls. This set includes two arms and two legs but no cloth body slip. Color of vinyl may vary depending on your computer monitor. Nikki 3/4 limbs are true to life in size and shape! For use with 3/4 limb body slip, sold separately. Includes arms and legs. Does not come painted. These 1/4 length limbs fit 19 to 20 inch long baby dolls. Use the with our 19" cloth body slip for 1/4 length limbs. Color of vinyl may vary depending on your computer monitor. Does not come painted. Snuggles 3/4 limbs are relaxed and calm, perfect for a sleeping baby. For use with 3/4 limb body slip, sold separately. Includes arms and legs. Does not come painted. Brandi 3/4 limbs are nicely angled for posing. For use with 3/4 limb body slip, sold separately. Includes arms and legs. Hugs 3/4 limbs have open hands. For use with 3/4 limb body slip, sold separately. Includes arms and legs. These limbs fit a 22" newborn doll and are made in Secrist's own special baby-soft vinyl that is translucent just like a real baby's skin. Set of 2 arms and 2 legs included. Corey 3/4 limbs are perfect for real baby short sleeve clothing. For use with 3/4 limb body slip, sold separately. Includes arms and legs. Does not come painted.